The highly durable, robust and ergonomically enhanced 1.7 kW petrol brushcutter. ErgoStart simplified starting procedure for increased comfort. 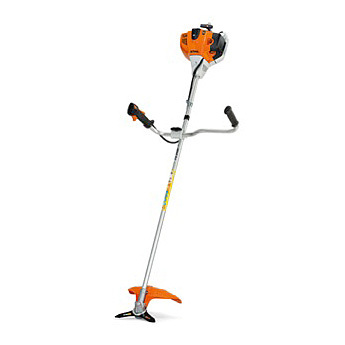 Powered by a low-emission, fuel-efficient Stihl 2-MIX engine. Ideal for agricultural and horticultural mowing work. The transparent fuel tank with a volume of 0.75 l ensures long working intervals with fewer fuel stops. The level is easily visible from the outside. Easy to refuel through a large, easily accessible tank opening. The easily accessible paper filter with a long service life means it can go for long intervals without changing. It is quick and easy to switch the setting from winter to summer using the slide control. Using the winter setting will prevent the air filter and carburettor from freezing. The central wing nut enables easy adjustment without the use of tools. For transportation and space-saving storage, the handle can be rotated by 90°.erts back to the start position for a quicker, simple restart.